Last week, 109 members of the military gathered at Joint Base Elmondorf-Richardson near Anchorage for two days of unsanctioned fighting. It’s an annual tradition testing soldiers’ hand-to-hand combat skills inside a cage. One fitting within the Army’s evolving standards for what constitutes a battle-ready soldier. 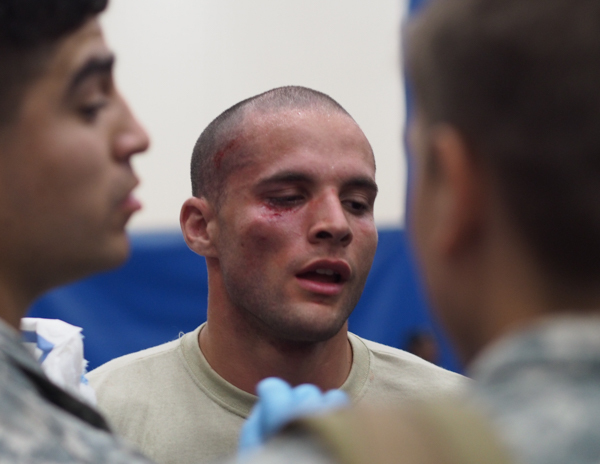 Every year, the U.S. Army in Alaska’s Combatives Tournament brings soldiers together to beat each other up. 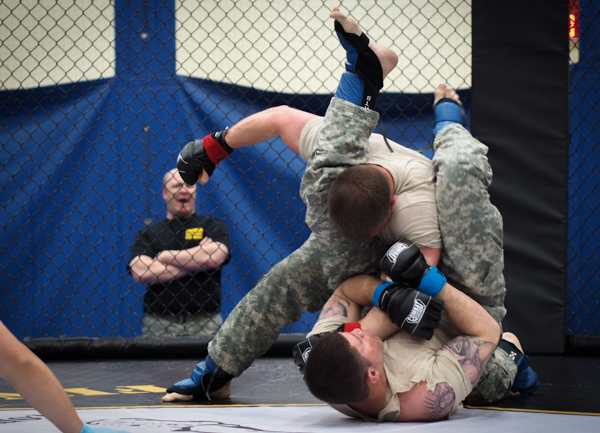 Combatives is the nickname for the army’s in-house fighting style, a combination of disciplines from across the world that, at the highest levels, looks like boxing until fighters slam each other to the ground in a tangle of choke-holds, arm-bars, and leg-locks. The Army overhauled its hand-to-hand combat program starting in the mid-90s, and in the last decade or so combatives has taken off. In a huge gym at Fort Richardson, soldiers, supporters, and spouses crowd onto folding chairs and bleachers around an octagonal ring as the advanced matches were hammered out. 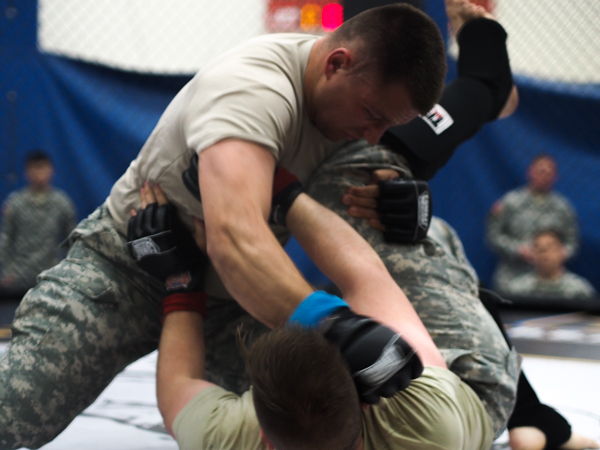 Aronhold is the outgoing trainer on base, and is a top-level combatives instructor. He’s also huge: about three radio-reporters wide by my own estimates, with a blue tattoo of a coy fish covering his massive right arm. The only reason Aronhold was not competing in the cage was because it’s his job to help referee matches. Shortly after a grizzly hook to the jaw laid a fighter unresponsive on his back for a few minutes, Aronhold explained that combatives is more than just blood sport. In modern war-zones soldiers may be going on house-to-house raids or conducting traffic stops, and need to know how they will react if stuff gets physical in close quarters. That’s why instructors like Aronhold practice choke-holds on each other, along with something called an Option 3 Drill. The second goal of the combatives program, and the one emphasized by far more people during the tournament, concerns mental health. “There’s a lot of soldiers that have PTSD and that like to fight because it helps take their minds off of things that have happened,” Aronhold said. That is certainly the case for Sergeant John Medeiros when he trains after a stressful day at work in his electronic warfare unit. “I don’t have time to sit there and dwell on the things that are bothering me in life and stressing me out when my training partners and coaches are trying to choke me and break my arms,” Medeiros said with a laugh, sitting on a folding chair by the side of the gym after the tournament ended. He was soar and a bit disappointed about taking second-place in the middle-weight division. He had gambled on a leg-lock, but in the process his opponent landed a few punches to his temple and jaw that left him dazed, and led the ref to call the match. Medieros has trained in wrestling, jujitsu, as well as combatives. Many of the serious fighters like him have backgrounds in other martial arts, and may supplement combatives exercises on base with after-hours sessions at studios and gyms in Anchorage. Medieros got involved with all this in the early 2000s while living in Georgia, when an elite group of Army Rangers just happened to be refining the techniques that now constitute combatives at nearby Fort Benning. Medeiro started wrestling when he was around 14, and his coach knew the Rangers on base. He got his impressionable teenage student hooked up with them for extra mat time. Though he only vaguely understood it at the time, Medeiro was cutting his teeth with some of the most elite fighters in the military. He also spends a lot of time coaching other fighters, partly to pay forward the assistance he got early on. He’s seen soldiers that are loners, have a hard time finding a place for themselves in the Army, and lack a meaningful outlet for stress. As a non-commisioned officer he’s taken at least one under his wing in the gym. “If I can introduce Jujitsu and combatives to one person that it’s able to put them in a better place and give them a better outlook, then I’ve done something positive,” Medeiros said. This year, the 125th Stryker Brigade from Fairbanks took first place in the tournament. But Medieros and others say that’s just until next year, when the trophy comes back to Fort Richardson.